I had been away from cooking and blogging for a long time.There are so many things that kept me away from you all.The summer is at its peak now so I hate to be in the kitchen.Lately,I got assigned myself to various jobs so I'm kinda busy these days.For the next few weeks,I will be travelling a lot for my admission proceedings and so I will not be able to catch up with you buddies regularly. This is my first attempt in Japanese cooking.I researched a lot in the internet for a vegeterian Japanese recipe.Finally,I settled with 'Gyoza'-a japanese style pot-stickers..Its actually called 'Jiaozi' in China and 'Mandu' in Korea.For the filling,I made a simple cabbage stir fry with sesame seeds.Since this is my first attempt,I made only a small batch. 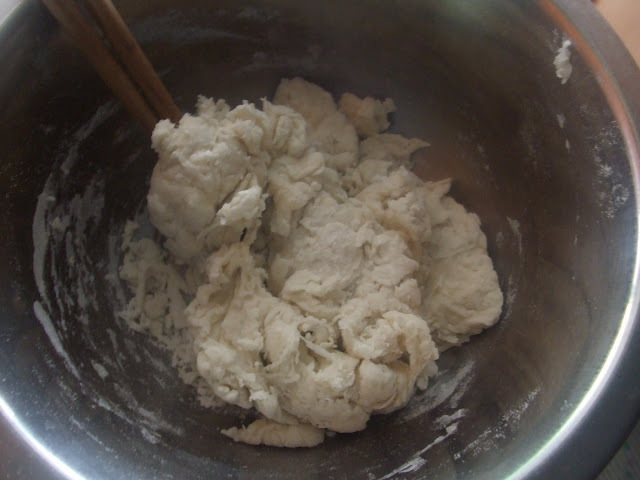 Mix the flour and water using the chop sticks.When it comes together as dough,knead well for 5 mins or until its smooth and elastic.Cover it with a damp cloth and let it sit for about 30 mins. 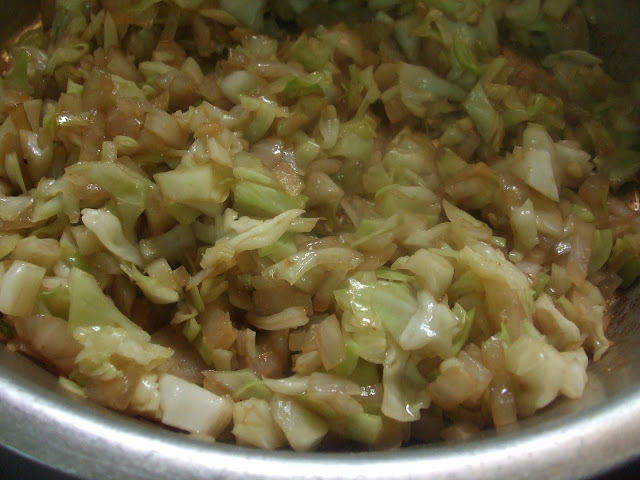 Heat oil in a pan,fry onion,ginger and garlic till transculent.Add cabbage and fry for a min.Add the rest of the seasonings and mix well.Allow to cool. 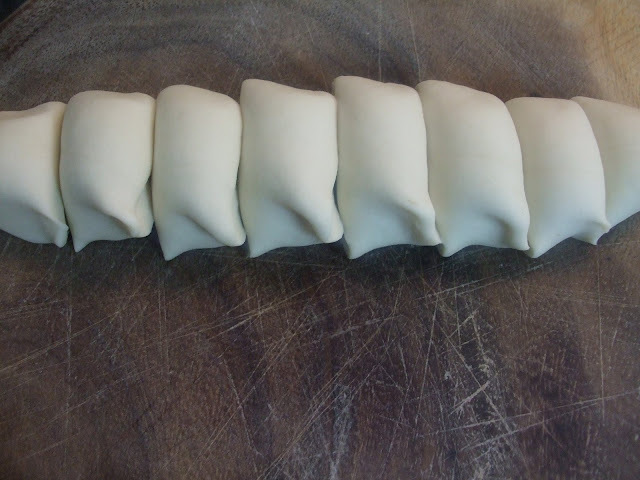 Roll the dough to a thick log and cut into 1 inch equal portions.Roll each portion into a thin,uniform,circular discs. Take a rolled out disc and place a spoonful of the filling in the center. Fold them like a semi-circle and press it gently on the center. Pleat the edges as shown in the picture. Repeat it with the rest of the sheets and filling. 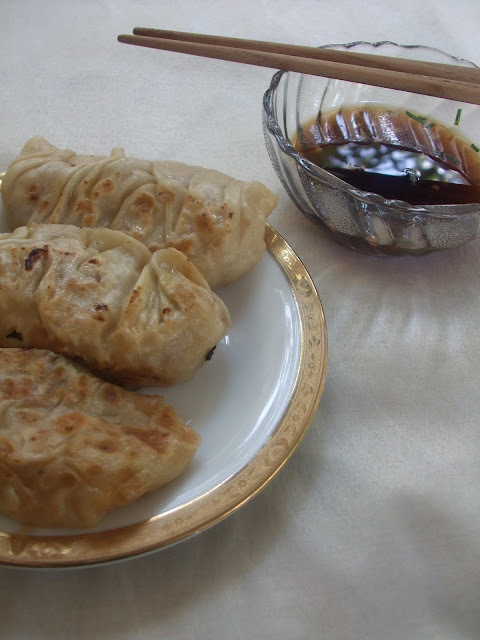 In a pan,heat a tsp of sesame oil and place the dumplings without overlapping them.Let it brown a bit.Flip it and pour 1/2 cup of water and cover immediately.Allow it to cook until the dumpling looks shiny and cooked. Mix all the ingredients under the dipping sauce.Serve this sauce for the dumplings. I liked the dumplings with this sesame flavored cabbage filling.But I can't handle the sauce.. I would rather prefer these dumplings with tomato sauce. This goes to AWED-JAPANESE guest hosted by Lavi of HomeCookRecipes and intiated by DK of CulinaryBazzar. Dont know much about Japanese dishes.Those dumplings are looking delicious madhu..
Dumplings look great! I liked the way you shaped them! It's easy to make those! Wonderful entry! Wow Madhu, simply amazing...its looks like chinese wontons dumplings....am ready to taste..Shall I?? that looks awsome.....I wld love to indulge in them Madhu :). wow madhu....loved the folding of these dumplings...it is looking great..
Looks awesome Madhoo..They are cute and yummy..
Btw,enjoy what you do and have a great time ahead..!! Gyoza looks yummy. The filling is interesting. I usually make a mixed veggie stuffing and call them pot stickers.. Looks great madhu. I am not a dumpling fan but my hubby lov it,will show ur recipe..yday he made chineese wonton..i liked the shape u made diff than other dumplings..
You inspire me to do more Japanese cooking. I adore dumplings. 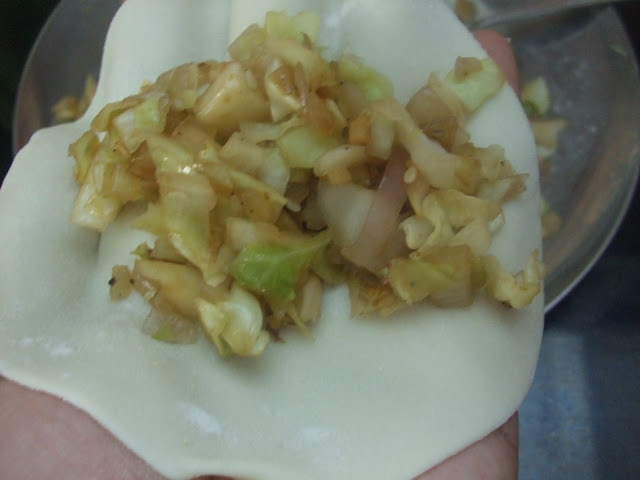 The dumpling with cabbage is just awesome! U shaped it beautifully! Dumpling looks great. Nice step by step presentation:). Dont knw much abt Japanese dishes....But u need a applause for trying these innovative items! I could have those every day and not get tired of them. I never thought to make the dough for the outside, I always buy premade, but how easy is that? Thanks for posting the recipe, I will be making this for sure! What a gorgeous recipe! 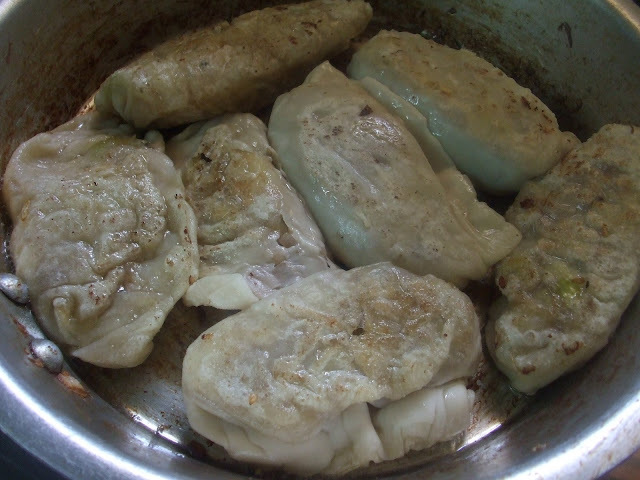 I love all of the ingredients you used, these dumplings look so so good I would love to bite into one. Good one Madhu.smart decision to make few for the first time.Looks very authentic. Great that u made these from scratch!Good luck with ur admission! Wow! that looks amazing. Nice click. 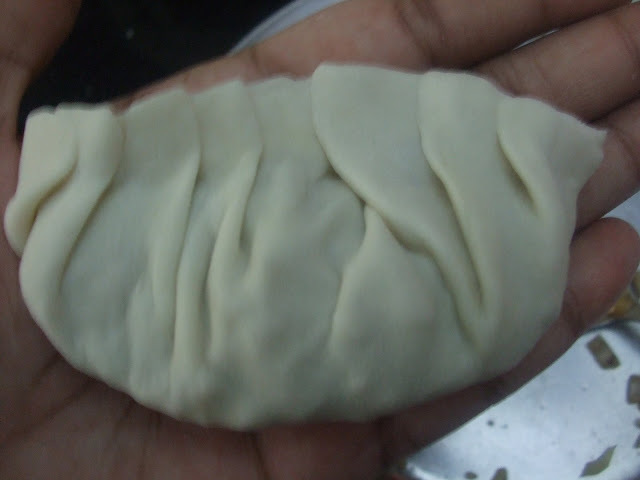 The shape of the dumpling r perfect. really yummy recipe.. looks great.. gud job!! I love international cooking. 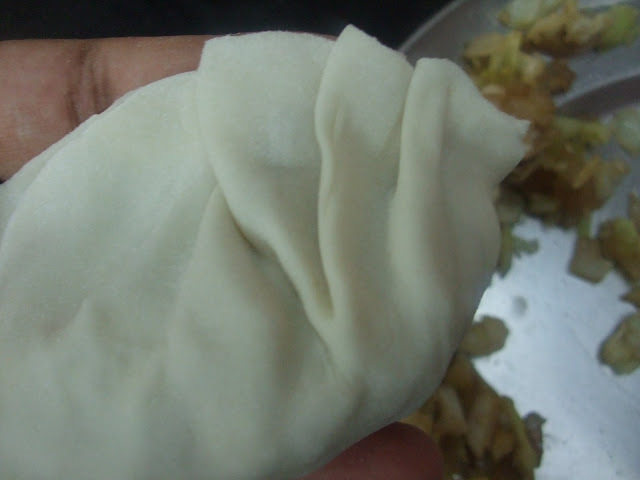 The shape of the dumpling are perfect. You go girl! These look so scrumptious better than any Japanese restaurant! oh my! i am in awe! fab recipe. i will try this for sure. u r so talented madhu! Mmm japanese dumplings look perfect madhu. Do check my blog for my FIL - 3 event. Expecting some entries from you! wow! looks yum n delicious! i am back my love. and i am floored with this dumpling. i pledge to make it one day. Yummy click and sounds delicious.Drop in sometime to my blog. You are missed. Hope you share your delicious recipes with your readers again soon. Dumplings looks great. U made it very simple. Thanks for sharing. That was a wonderful Japanese dish! you have a nice blog you can visit my blog view my recipes and give u comments. Since this is not boiled or steamed Jiaozi, adding some chives is also a good option, i guess i tried this in one of koerean hotels in chennai. Thanks, Dipping sause (soya, vineger, pepper oil) went good with this. BTW i am Vignesh's brother. these look so pretty! I may just have to try them :) YUM! Oh my my, this looks fabulous and a lovely recipe too:) Its been a while...how are you? 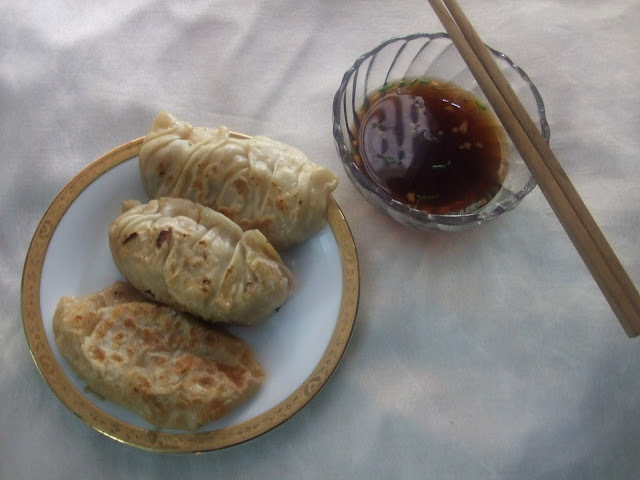 wow these dumplings look delicious, never tried making! I’d like to personally invite you to join the CookEatShare Author network. CookEatShare has had over 2.5 million unique visitors in 2009, and I think they will be interested in your content. Users will be guided to your actual blog, so this is a free way to increase page views and visitors to your site. Please contact me at mary@cookeatshare.com for more information, to get unique link to claim and customize your profile. Please visit http://cookeatshare.com/blogs/apply for additional information. Thanks a ton,Varsha & Priya! Thanks, Vignesh for your cheerful support !! I Love Your Blog Award! Thank you,Archy ,Nithya,Vibaas & Sriharivatsan!